Architects are constantly looking for new methods to create large indoor spaces unhindered by columns and other supports. Tensile and cable-strut structures are one method of producing such spaces. They also enable the creation of different shaped spaces allowing architects more scope for innovation. Free-standing Tension Structures: From Tensegrity Systems to Cable-strut Systems provides the background engineering needed to produce these wonderful structures. 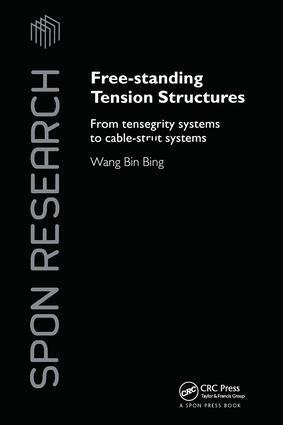 Providing a complete background to the underlying structural engineering theories of tensegrity, this book will prove invaluable for all architects and engineers working on tensile structures. Preface Part I: Tensegrity Systems 1. Introduction 2. Properties of Tensegrity Simplexes and Analysis of Pin-jointed Systems Containing Mechanisms 3. Structural Configurations, Properties and Design of Tensegrity Grids Composed of Simplexes Part II: Cable-strut Systems 4. Geometrical Characterisation of Basic Cable-strut Systems 5. Structural Properties and Design of Lightweight Cable-strut Grids 6. Application Studies of Lightweight Cable-strut Grids 7. Architectural Aspect of Cable-strut Systems Bibliography.